Apparently, the adoption of RSS is slow and may have peaked. While I cannot understand this, and I wish I could share the joy of RSS with the world, I also want people to actually read this blog. To that end, I have added an email subscription feature to this blog. Simply click here and enter your email to subscribe to ifedeli.com via email. 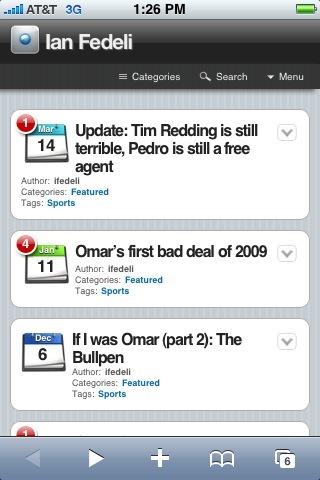 The link will also be available on the sidebar to the right (along with the link to the RSS feed). Also, I have added an iPhone optimized version of the site, which you will automatically see if you visit ifedeli.com from your iPhone.